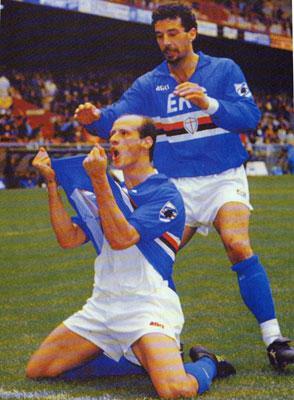 A look back at Sampdoria's relegation in 2011, Invernizzi, Lombardo, and the 1991 Scudetto. It still strains belief: Sampdoria, a team that won the Scudetto in 1991 and reached the European Cup final a year later, are going to be playing their football in Serie B. Admittedly, two decades is a generous amount of time to allow for all sorts of upheavals. After all, Sampdoria were also relegated from Serie A in 1999, but as recently as this season, they were within touching distance of qualifying for the Champions League proper. Only a spirited Werder Bremen side and perhaps the awe of the occasion denied them that opportunity. As heartbreaking as that loss was, surely no one expected their entire season to unhinge and lie splayed with one round to go. Recently, I had written of how costly Riccardo Garrone's well-publicized squabble with Antonio Cassano may prove in the final calculations; secretly, I had wished my portentous tone was misplaced. Even without Cassano and Giampaolo Pazzini, I felt, somewhere, that in players like Angelo Palombo and Nicola Pozzi (who was outstanding in the last few games) Sampdoria had insurance against catastrophe. The post-mortem of the club's season is painful as it is bizarre. A team that was sixth after fifteen rounds of play will not even suffer the final-day drama of a tense relegation battle. While Sampdoria fans despair now, it is perhaps some solace for them to look back on happier times (though depending on dispositions that may depress even further). My earliest memories of Sampdoria are from that 1990-91 season, during which the club won their one and only Scudetto. Alongside the popular, unforgettable characters of Roberto Mancini and Gianluca Vialli, I also recall Giovanni Invernizzi and Attilio Lombardo. Midfielder Invernizzi didn't score many goals for Sampdoria, but he thudded one in against Cesena on the opening day of the season. After a tangled struggle for the ball in the box, the ball landed at the feet of Invernizzi, who half-volleyed it from the edge of the area. The ball was struck with the ferocity of Invernizzi's celebrations after the goal. The midfielder had given his side the perfect start to the season by scoring the only goal of that game. Any memory I have of Lombardo is punctuated by a bald head which moved in earnest with his slaloms. It wasn't just a case of the follicles jilting the pate, but almost a wholesale betrayal. Lombardo's surging runs with that memorable head were a feature all season, but his strike against Bologna was simply stupendous. With his back to the goal, he received a pass in the area, wrong-footed two defenders with a quick turn, and fired home an unstoppable shot into the top corner of the net. It was a goal that would make Alessandro Del Piero proud. Sampdoria would have many magical moments that season, but I picked these two goals because they came from players whom people don't always recall from that side. This season Sampdoria were deprived of Cassano and Pazzini, undeniably two marquee players, but it was the failure of what was left that is most saddening. And what was left was not Serie B material by any means. 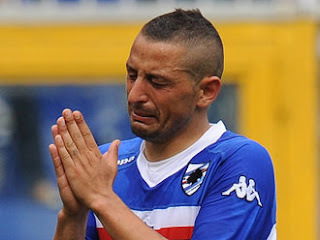 Sampdoria, you will be missed. Lombardo was hugely underrated! One of my favourite players of all time. That was a great team indeed. Pietro Vierchowod was another one of my favourites. Vierchowod! They don't make them like that any more! Unlucky that just as he was establishing himself in the national team, he was being superseded by Baresi. I used to like Katanec as well but I think he arrived just after the Scudetto.